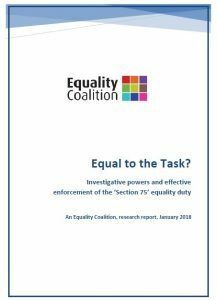 The Equality Coalition members have written and endorsed the following as a submission to any new draft equality schemes out for consultation in 2016-17, including the new Government Departments. The Anti Poverty Network and the Child Poverty Alliance launched the report of the conference hold on 5 April 2016 discussing how to meet objective need and develop an anti poverty strategy for NI. The outcome of the conference was 7 key principles that government should take forward when developing an anti poverty strategy to meet objective need and tackle social patterns of deprivation.